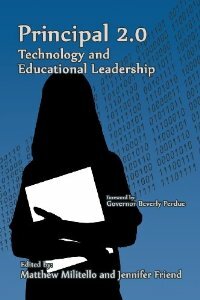 Remember last September when I made available for free my most recent book chapter, Supporting Effective Technology Integration and Implementation? Well, that chapter’s still available to you for free, but I’m pleased to announce that the rest of the book is now available as well. Featuring a diverse set of authors, perspectives, and topics, there’s something for everybody in Principal 2.0: Technology and Educational Leadership. Foreword: Ready Set Go! with Educational Technology, Governor Beverly Perdue. Introduction: Making the Case for Principal 2.0, Jennifer Friend and Matthew Militello. Augmenting Educational Realities, John Militello. The Role of For-Profit Firms in the Educational Ecosystem, Michael J. Schmedlen. Generation X Meets Generation Y: Reflections on Technology and Schooling, Jennifer Friend and Alexander David Friend. Zen and the Art of Technology in Schools: Multigenerational Perspectives, Matthew Militello, Ronald Militello, Dominic Militello, Luke Militello, and Gabriel Militello. Digital Storytelling for Critical Reflection: An Educational Leadership Story, Francisco Guajardo, Miguel A. Guajardo, John A. Oliver, Mónica M. Valadez, and Mark Cantu. Engaging Youth Voice: Collaborative Reflection to Inform School Relationships, Processes, and Practices, Christopher Janson, Sejal Parikh, Jacqueline Jones, Terrinikka Ransome, and Levertice Moses. There’s an App for That: 50 Ways To Use Your iPad, April Adams and Jennifer Friend. Student-Owned Mobile Technology Use in the Classroom: An Innovation Whose Time Has Come, Tricia J. Stewart and Shawndra T. Johnson. Affective Learning Through Social Media Engagement, David Ta-Pryor and Jonathan T. Ta-Pryor. The Central Texas Community Learning Exchange Digi-Book: Fostering School and Community Engagement Through the Creation of a Digital Book, Lee Francis, IV, Mónica M. Valadez, John A. Oliver, and Miguel A. Guajardo. Leaders Online: Enhancing Communication with Facebook and Twitter, John B. Nash and Dan Cox. Balancing Effective Technology Leadership with Legal Compliance: Legal Considerations for Principal 2.0, Justin Bathon and Kevin P. Brady. Connected Principals: In Pursuit of Social Capital via Social Media, Candice Barkley and Jonathan D. Becker. School Leaders’ Perceptions of the Technology Standards, Matthew Militello and Alpay Ersozlu. Supporting Effective Technology Integration and Implementation, Scott McLeod and Jayson W. Richardson. A big thanks to Drs. Matt Militello and Jennifer Friend for inviting me to be a part of this publication. Happy reading! My son is 8. He’s a maker. I just ordered my copy! Good luck with the book. The original chapter that you shared for download had fantastic statistics that were eye opening about instruction and tech integration. I am sure this book will be fabulous and looking forward to reading the entire book! Congrats Scott and all who were involved! Kim Caise, NBCT, M. Ed.